A week ago today we were privileged to launch Becky Cherriman’s poetry pamphlet, Echolocation at the Hyde Park Book Club. 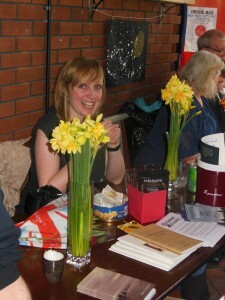 Big Bookend team member, Natalie Warrington, was there . It was an intimate reading in the cosy Hyde Park Book Club, with a fantastic atmosphere. Becky’s family, friends and supporters came along to hear her poems from Echolocation publicly read for the first time. Echolocation is about motherhood, love and loss, adoption and infertility, all based on her personal experiences. This is Becky’s first pamphlet, which was released in February, published by Mother’s Milk Books. ‘Ultrasonics’, ‘Eucharist’ and ‘Lullabies’ were some of the poems shared and it was brilliant to hear them read out loud; the emotion, brought to life, was so much stronger through her voice. 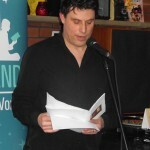 Michael Brown supported Becky brilliantly and read some of his poetry regarding fatherhood, telling his humorous but heartfelt accounts about life with his two teenage daughters. 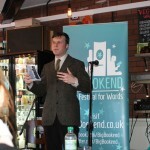 The whole afternoon was wonderfully compered by Otley’s new town poet, Matthew Hedley Stoppard. There was also an opportunity for the audience to join in with an Open Mic on the theme of parenting. 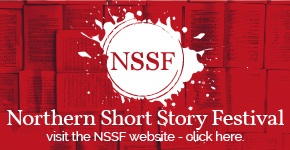 We had a wonderful tale about a snow child from Matthew Bellwood and then the Open Mic poets took to the floor to share their own work. It was really interesting to hear their diverse styles and some pieces were very emotive being based on personal experiences. The creativity was certainly flowing! We also sang Alice the Camel for the children (and the adults!) and a rousing Happy Birthday to Michael. It was such a lovely afternoon and I was so pleased to be part of it. You can catch up with Michael Brown on Twitter. Michael has a pamphlet out called Undersong which was released in 2014 by Eyewear Publishing. He is currently working towards his first full collection.